It's the middle of April now. There has been a pale moon in the sky over Tokyo in the afternoons this week. There was a little rain last weekend and some windy days and the cherry blossoms are disappearing fast. But weeping cherry trees - shidare zakura - often bloom late and the blossoms are still full and beautiful. The rhythm of nature and the seasons is very important in Japan. People set aside a time to look at the cherry blossoms. Cherry blossom viewing is called hanami. Hanami was mentioned in the eleventh century in the world's first modern novel, The Tale of Genji by Murasaki Shikibu. Still today families and groups sit under the blanket of blossoms with lunchboxes and perhaps beer or sake. 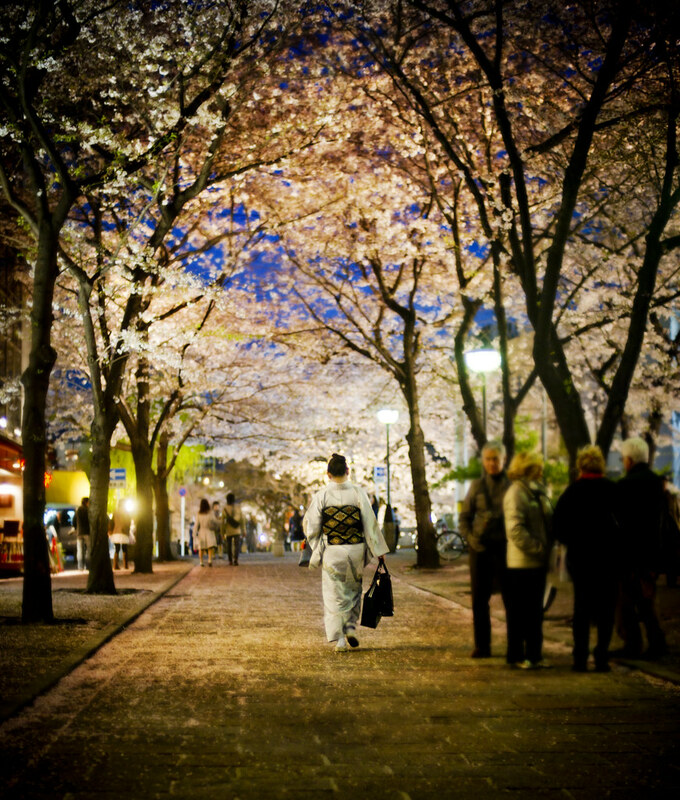 Hanami can be in the day or after dark. The cherry blossom represents the intensity and the impermanence of life. The blossoms are beautiful, and then they blow away in the wind. Nothing is left. Mujou - impermanence - has a sadder resonance this year in the aftermath of the Tohoku earthquake. Nobody knows what will happen tomorrow. Quakebook: an ebook of essays, stories and artwork about the Tohoku earthquake pulled together in just a few days using twitter. Contributors include William Gibson and Barry Eisler. It costs $9.99 and Amazon doesn't take anything - 100% goes to the Japanese Red Cross. Buy it if you can. 6 Responses to "cherry blossom and moon"
Carina thanks for all your careful thoughts and links. Thanks for your thoughtful, perceptive and positive comment, Francis! Beautiful photo and post, thanks Niall ! The cherry blossom shows its beauty and disappears, this must happen to become the tasty fruits and green leaves to give shade in the hotest days of the summer,then leaves change to golden brown in autumn and disappear in winter. This is the circle of life. In aikido when we take ukemis there is an instant when we don't touch the soil we are flying it is beautiful and ephemeral for one self and for people who are watching. With your seemingly enigmatic "Moon in the Water"opening, I cannot help but imagine that a similar result occurs each time two people meet unawares and unbidden by voices hidden. As always, cheers and banzais for good thoughts and dreams. This too will pass away, and then, there we are. Take good care, Niall.